Live Healthy | Tips on Living a Healthy Lifestyle NO MATTER WHAT. Blend together and enjoy. 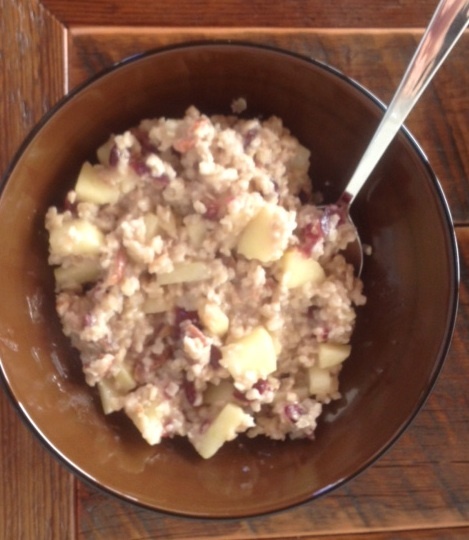 Using those strawberries made such a difference…so glad they’re back in season! Off to my work out. Stay tuned as I try to blog next week about the Ayurvedic Detox I’m doing next week. Have a great rest of the week, everyone! 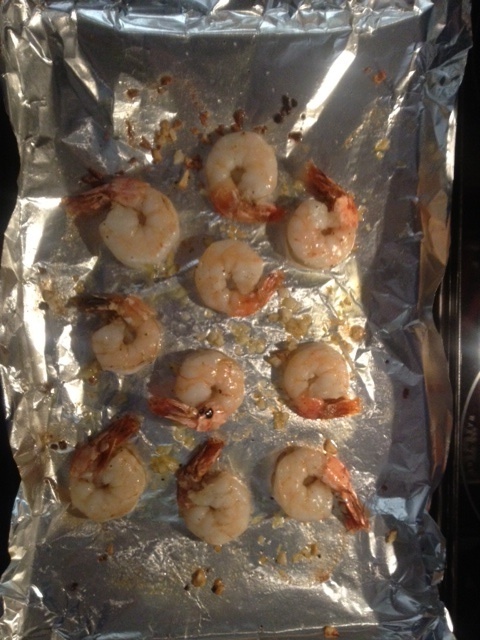 NOTE – baking times may vary depending on the size of your shrimp so keep an eye on them the first time you do this and use your best judgement. Like I said, I’m using these shrimp for a Caesar salad; however, I have also used this recipe and added parsley for a nice shrimp appetizer and I’ve also used it to put in pasta dishes so be creative with it. Enjoy and, as always, leave your comments and suggestions! On Saturdays, I spend time thinking about what we will eat for the week and then plan out the menu and create a grocery list. This way, on Sunday, I am ready to go out and get everything I need for the entire week. For me, this saves time, money and energy. As I’m planning my menu for the week, I make sure to think about what’s going on each night so that I can plan accordingly (i.e. if I won’t be home until later, I will plan to make something with leftovers or ask my husband to make dinner that night). Anyway, I thought it may be helpful to post my menu’s on the blog, not only for you to get ideas, but also for me to remember what I’ve made in the past when I’m struggling to think of something to add to a new menu. I hope this helps. Let me know your favorite weeknight meals by leaving comments below. Good Morning, All! 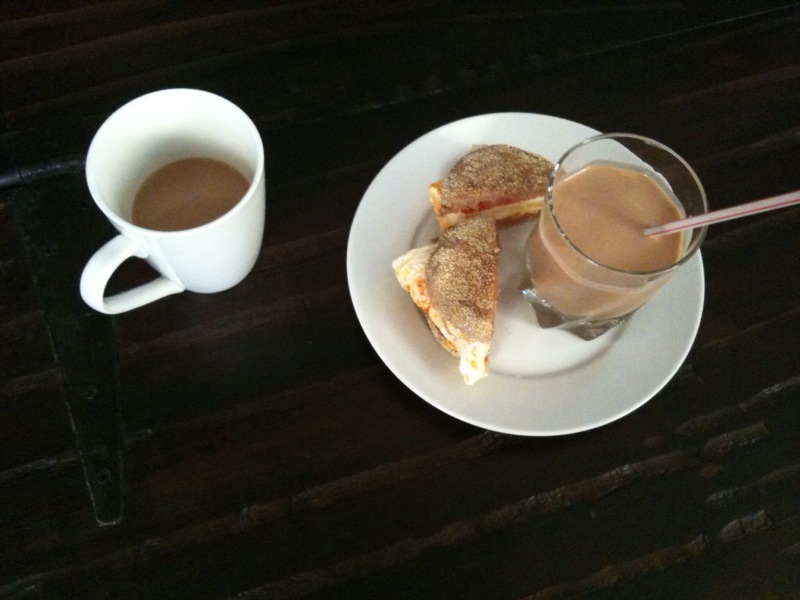 This morning, I decided to make an egg sammy and a protein shake for breakfast. Yesterday, I wrote about how much I love protein shakes and that I have them almost daily. On mornings that I make egg sandwiches for my husband and I, I typically accompany those with a shake – I make one and we split it. Blend it up and voila! You have a delicious protein shake! For my egg sammies, I use 1 full egg and 1 egg white that I cook in the frying pan with cooking spray. I like to add a few splashes of hot sauce as well and a slice of tomato. Sometimes, I’ll saute a little spinach in EVOO first, then add the egg on top and serve that in the sandwich with a slice of tomato – I didn’t have spinach this morning though. Also, DON’T WASTE YOUR YOLKS…do you have a pet? I have a dog and she gets scrambled egg yolks every morning. It’s a nice treat for the pup and I don’t waste any of the egg, as I toss the shells in our compost pile. Please leave comments to let me know your favorite protein shake recipes. Protein shakes are pretty much an everyday treat for me. I say treat because the way I make them, they’re delicious and because my flavor of choice is fair trade dark chocolate. Since I’m mostly eating vegetarian these days, but still pretty green at it (pun intended), I like to supplement my diet with protein shakes to make sure I’m getting enough protein on a daily basis. I have tried several different protein powders and this one CRUSHES the competition in both taste and ingredients. By the way, there are only FIVE ingredients and I can pronounce them ALL! 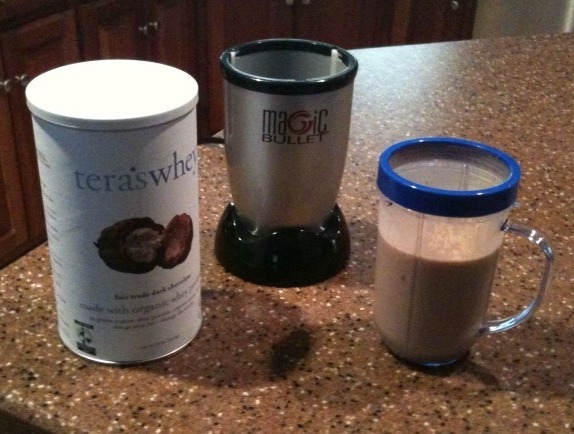 So, if you’re in the market for protein, Tera’s is the “whey” to go! Next essential when it comes to ma shakes…the Magic Bullet. If you make lots of shakes like I do, this will come in handy; it’s reasonably priced and makes it easy and mess-free (this is important for me) to make them. I have also used the Magic Bullet to make marinades and spice rubs as well. In terms of shake recipes, I typically make the same shake each time; however, I like to change it up from time to time. I will plan to post my shake recipes as I try new things so stay tuned. For your reference, I try to have my shakes within an hour (either before or after) a workout.